Hitting thirty has been a real eye - opener for me in terms of skincare and how I want to look and feel. If the twenties are about experimentation, then the thirties are for buckling down and getting a little more serious. I find myself craving simplicity. Gina mentions it in this post and I absolutely agree with her. Even if I find the time to take extra steps in my routine, I don't really bother. I'd rather spend those extra minutes playing with my dog or watching the news. Simple is just better, easier. I'm trying to downsize on everything, including my makeup and my wardrobe. I spent most of yesterday trying on clothes, organizing my closet, donating those pieces that just don't fit anymore, and tossing out old makeup. It was hard, because I can feel the weight I've gained over the last year but it also served as a reality check, and was cathartic as well. Small changes can make the biggest impact. One change is that I no longer crave a matte face. My skin has matured, unfortunately. From oily to dry. I now want a dewy youthful complexion, the one I so desperately tried to hide just a few short years ago. Luckily it's pretty easy to achieve with the products shown below. I first spray fix + on my makeup sponge to get it really damp, then I pat a pump of the foundation over my face and use the dampened sponge to create a nice even glow. 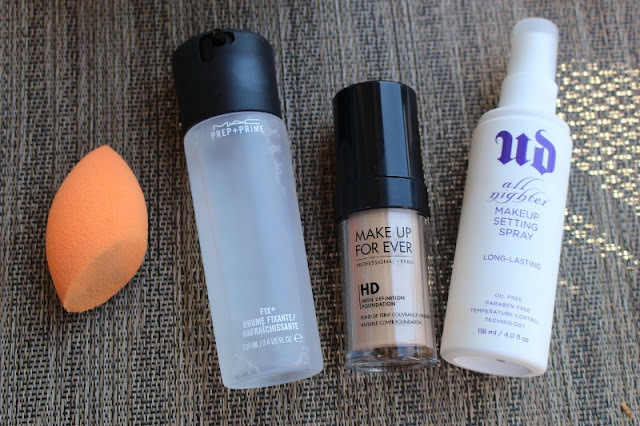 Once I apply the rest of my makeup (mainly blush and concealer), I spray the all-nighter for even more moisture. I no longer use a setting powder, unless I go to a special event like the weddings I attended this Spring. I rarely talk about products I regret buying, but this has to be said. These makeup remover wipes are terrible. I really dislike them. Sorry MAC, love you. Love the scent of them, but these are a big disappointment. I don't know if I just got a bad batch but they are as dry as my skin is lately, and it takes multiple wipes and some work on my part to remove my liner, shadow, and mascara (and I don't exactly pile that on either). I'll stick to my Aveeno wipes. If they are good enough for Jennifer Aniston, they are good enough for me. I'm also sticking to wearing clothes that I love, and I'm going to take Gina's lead and not apologize for re-wearing certain items over and over...and over again. My Barcelona camisoles from Express, my Loft jeans, my white Topshop skirt - I want to be comfortable in my own skin, and part of that means wearing things that I love, even if there's nothing remotely new about them. It's easy to get caught up and compare yourself to others, but that doesn't get anyone anywhere. As a reader, I personally enjoy seeing how people re-work their clothes. If you wear something often, that must mean you love it, right? One of my favorite looks. A few days ago, I wore it exactly in the same way as I did a couple of years ago. I didn't have Nate take photos though, because I was afraid of repeating and now I realize how silly that is. Bottom line: Stick to what works, and most importantly, what you feel good in. Simplicity is key. That's so sweet Gina, thank you. Blogging is pointless if you can't learn from others in my opinion. I love how you use your blog to inspire people to find their own personal style and be confident in it. It's a great message! That's why so many people are loyal readers (myself included of course). this year I turn 30 and I have to say I am loving my skin, I'm almost not breaking out at all so my dark spots are fading. My skin is still pretty oily, but I found a few products that just work for me. Just keeping it simple. That's great! I don't break out much anymore either and I'm so thankful for that! I feel ya with the turning 30 thing..I've been here for a few years, and you do have to adjust your routine. I love that UD setting spray, a total must have in my opinion! That's awesome that you are so comfortable in your own skin. It shows! I'm getting there, slowly but surely. Im trying not to dwell on the past and how things used to be. Moving on! Firstly - I can't fathom that you've hit thirty - in my mind you're forever 24 - and you look it too! I've had a bottle of fix+ lying around for a while - and am only recently rediscovering it's amazingness - I love using it to wet my eyeshadow brush before applying eye makeup - gives my look serious depth and staying power! I don't think I purposely try to be complicated, but I know my fashion and beauty life is anything but simple. :) I certainly appreciate cutting out non necessary things in your life though and I would never judge you for repeating pieces you love! You always look great! I'm really wanting to try the setting spray! How does it dry on your skin? It's so hot here that after I've applied my makeup it immediately starts melting. Grrrrr! Try it! It sets in less than one minute. I shake the bottle and then do a few quick bursts all over my face. Feels amazing! It dries quickly and leaves skin refreshed. Trust me, it gets very hot here too (it's been over 100 lately). Thanks for huge information and tips.